Employers are always looking for the best candidate for the job, so when Cadbury received a questionable, jaw dropping, hilarious application for a senior management position at the company - all bets were off! 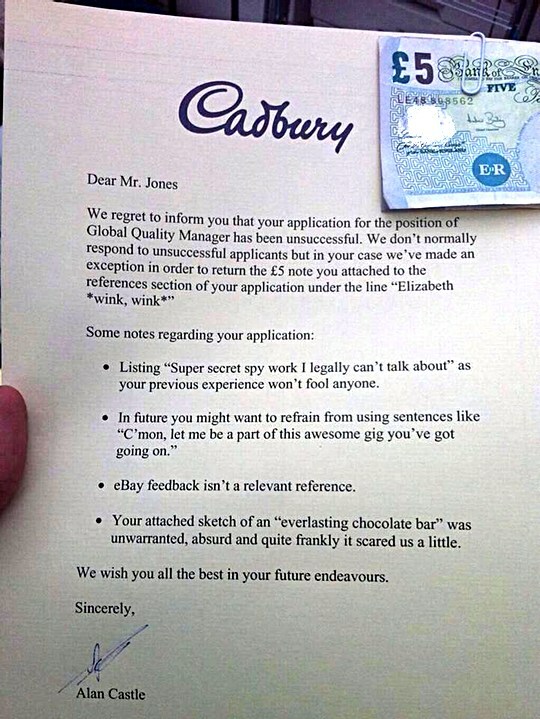 The now infamous "Cadbury rejection letter" should serve as a warning to all job seekers. The application from an individual who claimed that he is a former secret spy, cites eBay feedback as one of his references, and urges the company to employ him by writing "C’mon, let me be a part of this awesome gig you’ve got going on" is rather absurd. This application also included a sketch of an "everlasting chocolate bar," however, perhaps the most notable aspect of this application was the five pound note (which Cadbury nobly returned) that the applicant attached to his reference section claiming Elizabeth as one of his references "wink, wink!" Hoax or not, when the applicant posted Cadbury’s response to their application online it created more buzz in record time than an uploaded video of a fluffy kitten playing with a ball of yarn. There is something rather unsettling about this whole affair, whilst the comedy factor of this entire story is a crowd pleaser - the reality of misguided job applications is no laughing matter. Cadbury’s response to this alleged application which represents every employer’s worst nightmare is well-rounded. They are the heroes for putting this prankster job seeker on the right path and for making innovative, delightful chocolaty treats whilst they’re at it. Applying for a job can be highly competitive. Take the graduate job market for example, recent statistics in the UK show that there has been a 4% fall in graduate job opportunities, making competition fierce amongst at least 85 applicants vying for the same position. This means that employers can afford to be picky. The emphasis placed on having a good job application is not a life or death situation but, if you take our chocolate loving applicant here, you get the point. Far too often job seekers are missing out on ideal job prospects by not providing a suitable application. Spelling errors, paragraphing mishaps, and a violation of the English language could be having a negative impact upon how employers are processing your attempts at finding employment. Embarking on a successful job search should include sending applications that are reflective of your personal skills and professionalism. If you notice that the rejection messages you have been receiving just keep piling up, you should review your CV immediately. There is no excuse for bloating your job applications with seemingly impressive and fictitious tales that employers can see right through. The quality of your applications should speak volumes about you as a potential employee, you should be projecting a positive, confident, competent persona each time you apply for work. Fail to do so, then you might find yourself last in line for that dream job. Keep your applications simple, truthful, well formatted, and you’ll be poised for glory. If not, well, you can always take comfort in eating a chocolate bar when the rejection letters keep coming, yum.